I know, a journal is not exactly the top weight loss resource/item, so to speak, right? Besides, keeping a journal seems just sooooo complicated and boring. But bear with me as I’m about to show you exactly why journals are great, and how they can improve your weight loss results noticeably. First things first, I was never attempting to lose weight … I’m a member of the opposite camp – the “gain weight” camp. Where weight means muscle. But even though I don’t have a direct weight loss experience I do have experience using a journal for muscle gain… And. It. Simply. Works. The main reason is this: What gets measured gets improved. I’m sure you’ve heard this once or twice before. But this actually goes a bit deeper. The point isn’t only to get your measurements stored somewhere. For that, you only need Microsoft Excel or other spreadsheet software. A journal gives you a possibility to write down your thoughts, and also to say something about your mood when you’re on a diet / weight loss workout / or both. Another benefit is that when you’re writing an entry for your journal (or recording a video – more on that in a minute) you’ll often draw some conclusions that can help you to improve even more. The thing is that there’s really a lot of stuff going on in our minds in any given second, and if you don’t have any way of putting this stuff somewhere then it will be all forgotten. Writing a journal is therefore the best way of keeping you sane when pursuing the difficult task of losing weight (or gaining it). As in: what to journal about. And the answer is simple: everything and anything. Apart from the technical stuff like: your current weight, your measurements, body fat percentage, and such, you can also store random thoughts, ideas, and plans for your next actions. When creating an entry, it’s best to focus on what the weight loss journey you’re on means to you, and how you’re getting through each day. For instance, maybe you’re feeling bad about getting a cappuccino with a whipped cream topping earlier today… Well, write about this and think of a way to fight the temptation in the future. A journal is perfect for coming up with such stuff. Finally, remember to say something about the way you feel in general, and what mood you’re in. If you’re getting good results and writing about it in your journal then this can (and will) turn into a huge motivator to go forward … and that’s the point. Now the interesting stuff. 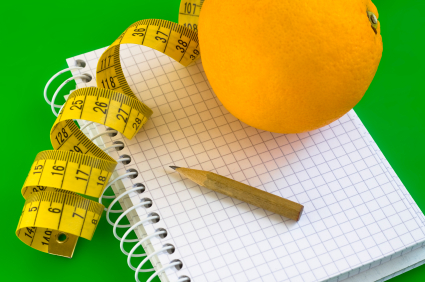 There are a handful of ways to keep a weight loss journal. You can go the all-traditional way with pen and paper (or a nice Moleskine notebook). This way you can grab a cup of tea and write an entry while sitting in front of a TV in the evening. The only problem is that such a notebook might get read by someone else, which you’ll probably not enjoy, especially if you’re sharing some personal stuff. The next approach is with the use of some modern technology. If you have a smartphone or a tablet then you can take notes there. This will make your journal similarly portable as a traditional notebook. However, it doesn’t solve the issue of protecting your content. For that, you’ll need something more, preferably a particular piece of software (there are some great apps widely available, so there’s no problem). The most basic thing to do is use Microsoft Word and encrypt each file with a password (a built-in feature in Word). This way you can rest assure that no one will read your stuff. (There’s a similar functionality available for Mac users too). One more approach is to use an online journal app like Penzu. It’s free, secure and it makes sure that no one else sees your entries. You can sign up for free and then access your journal from any computer with internet access (smartphones and tablets included). Finally, you can create a video journal. This is probably the most complicated approach you can take when it comes to a weight loss journal, but if you’re naturally not afraid of the camera then it won’t be a problem for you. Additionally, talking on camera will probably be much quicker than writing. Now, you don’t have to show your videos to anyone. You can either store them on your computer (privacy issue again), or you can upload them to YouTube and mark them as private, so nobody else can see them. This way you have your journal on the internet, for your access and reference only. This final piece of advice is about when to create your journal entries. There are two solutions that make the most sense to me. Do it either in the morning (before going to work), or in the evening. Or you can somewhat combine both approaches and take your measurements (and weight) in the morning, but write a new entry in the evening. By the way, taking your measurements in the evening is of no use. You’ll always get the most accurate readouts in the morning immediately upon waking up. So no matter when you’re writing your journal entries you’re going to have to measure yourself in the morning anyway. Also, decide how often you’re going to create new entries. Taking your measurements once a week is okay, but doing it more often won’t show any significant improvements. When it comes to writing entries I actually encourage you to do it daily (it’s a nice relaxation activity, by the way). This should keep you strong and motivated (the key to success in every weight loss journey). That’s it for my advice. What’s your take on this? Have you tried using a journal to help you lose weight and remain healthy? How about giving it a shot? Guest Post Author Bio: Karol K. writes about dieting and finding effective ways to remain healthy. He contributes articles on weight loss, and working out. He also enjoys writing occasionally for WeightLossTriumph. He’s all about active living and being involved in some kind of physical activity every day. In his personal life, he proves that one doesn’t have to struggle to stay in shape. I don’t have a journal but I guess you could consider my blog one! It helps keep me in check. Just like a budget! it is so much easier to spot where you are doing good and well when you write it down. Otherwise you just forget and vaguely think it can’t be that bad. That’s right. I honestly think that just the sole fact of writing things down can improve your results a lot. My wife did this a number of years ago and was able to have great success with it. It makes real the food choices you’re making and you can see ways to improve upon them. Exactly, you can also see what you’re doing wrong. When I’ve tried to watch what I eat I use online trackers like myfitnesspal, where I believe you can make notes and journal how you are feeling. They do see that those that track get the best results. I use myfitnesspal too, but I’m not sure that all nutrients are correct there. Diet and expense journals work very well! It makes the individual aware of what they are eating and spending. In theory, if you know what you are doing wrong you will make changes.Too often, we are not aware of our mistakes. Or we don’t like the concept of us making mistakes. In such a case, using a journal makes everything clear. Tried this one; regretfully being very obsessive it only winds me up. What I am doing now (and in preparation for entering an ultra running event one day soon) I am doing a thing called ‘slow burn’. I journal my food every.single.day. I just got to goal on WW and when I don’t journal, I don’t do well. Even now at Goal, I continue to journal. It works most of the time to help me make good choices. I take the effort to journal every day too. It’s also great for handling emergencies. Like for instance when you didn’t manage to eat a normal dinner and you have to find a solution that’s healthy and can deliver the same nutrients. I find apps like Evernote can be great for tracking things like this. Great tips Miss T.
Evernote also has a number of side apps that work with the main platform. Also, when you’re using additional apps like myfitnesspal, you can generate stats automatically, along with some graphs and trends.